According to a new market research report published by Transparency Market Research titled ‘Insulation Monitoring DevicesMarket (Feature: With Display and Without Display; Measurement Method: DC Voltage, AMP [Patented by Bender], and Low-frequency AC Voltage; Device Type: With Coupling Device and Without Coupling Device; and Application: Healthcare, Railways, Mechanical & Plant Engineering, Mining, Oil & Gas, Ships&Ports, Renewable Energy, eMobility, Mobile Power Generation, Public Power Supply Networks, and Data Centers) – Global Industry Analysis, Size, Share, Growth, Trends, and Forecast, 2019–2027,’ the global insulation monitoring devices market is expected to reach 5,652.31 thousand units, in terms of volume, by 2027. The market is projected to expand at a CAGR of 5.42% from 2019 to 2027. According to the report, the global market is expected to continue to be influenced by rising demand from the global renewable energy sector, increasing implementation of IT power supply networks worldwide, and availability of industry standards pertaining to insulation monitoring devices in the near future. Asia Pacific is estimated to continue to lead the global market, with the market in the region expanding at a CAGR of above 6% during the forecast period. Prominent economies in Asia Pacific such as China, Japan, India, and Australia, are adopting insulation monitoring devices increasingly. In terms of application, the global insulation monitoring devices market has been segmented into healthcare, railways, mechanical & plant engineering, mining, oil & gas, ships & ports, renewable energy, eMobility, mobile power generation, public power supply networks, and data centers. Insulation monitoring devices help in enhancing the machine safety so as to avoid any malfunctioning that can lead to accidents. Production processes in industries such as food & beverages and automotive are fully automated and they must not get interrupted by any kind of fault in insulation of the electric system. Insulation monitoring devices help in early detection of fault and allow the operator to resolve the issue, without any need for shutdown of the entire production unit. With increasing focus on factory automation or ‘Industry 4.0,’ demand for insulation monitoring devices specified with various industry standards such as EN 61557-8, EN 61557-15, and EN 61557-9 is projected to increase in the next few years. In terms of device type, the insulation monitoring devices market has been segmented into with coupling device and without coupling device. With coupling device segment holds a lower market share, as very few applications require use of insulation monitoring devices with coupling device. Their use is basically needed in case of applications that require high voltage. Insulation monitoring devices with coupling device help in increasing the nominal voltage of the entire system to reduce the effect of high voltage on the application. A large number of applications such as data centers and automotive function based on the lower-voltage method. This factor drives the with-coupling device segment. 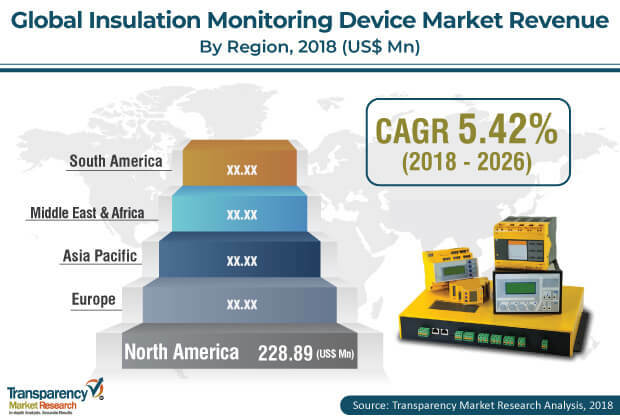 North America and Europe are expected to hold a major share of the global market for insulation monitoring devices during the forecast period. Leading share of these regions is primarily attributable to strong presence of well-established players across the region, especially in prominent economies such as the U.S., Germany, the U.K., and France. These well-established players include Bender GmbH & Co. KG, ABB, Viper Innovations Ltd, Schneider Electric, and HAKEL LTD. Furthermore, these regions are projected to lead the global insulation monitoring devices market during the forecast period, due to growing industrial automation, availability of standards that insist on the use of insulation monitoring devices, and technological advancements in insulation monitoring devices. For instance, in 2018, Bender GmbH & Co. KG, a Europe-based manufacturer of insulation monitoring devices, announced the launch of an innovative variant of insulation-monitoring devices called ISOMETER isoHR685W-D-I-B. The device provides advanced insulation resistance capability of up to 10 GΩ. It is designed for monitoring of cables. With the help of this device, the user is warned before degradation of the entire cable. The report includes profiles of well-established players operating in the global insulation monitoring devices market. These include Bender GmbH & Co. KG, ABB, Viper Innovations Ltd, Schneider Electric, Littelfuse, Inc., and HAKEL LTD. These players are focused on offering technologically advanced productsto their customers and meeting the rising demand from customers. For instance, in 2018, Schneider Electric, a manufacturer of insulation monitoring devices, collaborated with Larsen and Toubro Ltd to buy the latter’s electrical and automation businesses and integrate those with its low-voltage, industrial automation products that include insulation monitoring devices. This collaboration would help Schneider Electric tap the significantly expanding market in India. Furthermore, in 2018, Bender GmbH & Co. KG announced the launch of a novel variant of insulation monitoring devices called ISOMETER isoHR685W-D-I-B. The device offers advanced insulation resistance capability of up to 10 GΩ. It is designed for monitoring of cables. With the help of this device, the user is warned before degradation of the entire cable. The research report encompasses current trends in the global insulation monitoring devices market. The study highlights factors that are driving and restraining the market. The report also provides opportunities for the global insulation monitoring devices market. The study provides a complete outlook for the insulation monitoring devices market, in terms of revenue generated and production volume, across multiple regions such as North America, Europe, Asia Pacific, Middle East & Africa, and South America. The report covers the insulation monitoring devices market in countries/sub-regions such as the U.S., Canada, Germany, France, the U.K., India, China, Australia, Japan, GCC, South Africa, and Brazil. The report analyzes and forecasts the insulation monitoring devices market at the global and regional levels. The report consists of an in-depth study of the market value chain, which gives a complete overview of the global insulation monitoring devices market. Inclusion of Porter’s five forces and PESTEL analysis models helps in understanding the competition scenario in the market. The research study also covers market size (in terms of revenue and volume), growth rate, and general attractiveness of the global insulation monitoring devices market. The research study of the global insulation monitoring devices market provides detailed analysis of different segments of the market including feature, measurement method, device type, and application segments. Based on feature, the market has been bifurcated into with device and without device. Based on measurement method, the market has been divided into DC voltage, AMP (patented by Bender), and low-frequency AC voltage. In terms of device type, the market has been segmented into with coupling device and without coupling device. Moreover, in terms of application, the insulation monitoring devices market has been segregated into healthcare, railways, mechanical & plant engineering, mining, oil & gas, ships & ports, renewable energy, eMobility, mobile power generation, public power supply networks, and data centers. Secondary research sources that are typically referred to include, but are not limited to: company websites, annual reports, financial reports, broker reports, investor presentations, SEC filings, internal and external proprietary databases, relevant patent and regulatory databases, national government documents, statistical databases, news articles, press releases, webcasts specific to companies operating in the global insulation monitoring devices market, national government documents, statistical databases, market reports, and Factiva. Primary research involved e-mail interactions, telephonic interviews, and face-to-face interviews conducted for each segment and sub-segment of the insulation monitoring devices market across different geographies. TMR conducts primary interviews on an ongoing basis with market participants and commentators in order to validate the data and analysis. Primary interviews provide firsthand information on market size, market trends, growth trends, competition landscape, and market outlook. These help in validation and strengthening of secondary research findings. They also help develop market expertise and understanding of the team of analysts. The report includes profiles of well-established players operating in the global insulation monitoring devices market. These are Bender GmbH & Co. KG, ABB, Viper Innovations Ltd, Schneider Electric, Littelfuse, Inc., and HAKEL LTD. These players are focused on providing technologically advanced products to their customers and meeting the rising demand. For instance, in 2018, Viper Innovations Ltd, a manufacturer of insulation monitoring devices for rail and subsea applications, upgraded its insulation monitoring device called V-LIM (Line Integrity Monitor) in order to resolve the issue of cross-disturbance between two insulation monitoring devices. With this product upgrade, the company resolved the issue by offering a long-term solution.